I would love to be debuting a trailer for Layover to you right now but alas -- it cannot be. 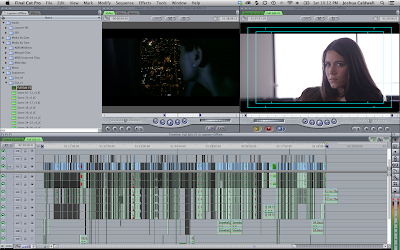 However, in the image above you'll see the Final Cut Pro timeline for the full film, all 88 minutes of it. (Yes, I'm still using Final Cut Pro 7.) I got the assembly cut at the end of July, watched it, posted about it, and then set to work fine tuning and doing the next pass. Due to development on other projects and the fact that Will is not being paid, it's taken us a while to get to that second cut. We probably could have gotten it done sooner if we had treated it as a true second cut and just gotten scenes close to good rather than really going over them again and again. But I don't work that way. Probably why I tend to not do a lot of passes. Three to four at the end of the day, mostly because by the time I get to a full second cut, I've gone over all these scenes several times, making changes as I do. Which is also why it took us a little longer to get to the second cut than it might normally. For the most part, the editing went smoothly but there are definitely some monster dialogue scenes that took some finessing to get them into place. As I mentioned in my previous post, my films tend to be like puzzles, with only one to three ways scenes can be put together. I don't shoot A LOT of coverage and it takes some trial and error to figure out how these things can be cut together. One of the more interesting aspects of diving in was the French language. I often had to consult my script to find out what exactly was being said and make sure I didn't miss any lines (I won't know for sure until I have some French speaking friends give it a look). But ultimately, as I thought I would, I found myself paying much more attention to the performance, to the nuances, to how this reading of a line changes the tone of the scene. This happens anyway but I got to remove the text portion of the experience. My goal was to find a way to sell this without having subtitles. That someone might get it even if they didn't get exactly what was being said. After much tinkering, I finally put all the sequences together in order to show Travis, my producing partner. I wanted his thoughts before anyone else's. At first, he tried to read the script along with the film since I hadn't added subtitles yet (by the way, anyone know a better and not-expensive way other than manually doing it myself?) but eventually gave up. I was incredibly nervous about showing him. After all, it was through him we got the investor to fund the film and I know he had a big stake in it as well. The last thing in the world I'd want to do is let him down. But at the end of the day, he really liked it (sans subtitles) and mostly felt it needed some tightening in scenes. He thought all the performances were great and right on and that the film felt far larger than it's meager budget. Even though I feel pretty confident about this cut there's still a lot of work to do. There are some sections of the film that require music, and specifically require cutting to music (non-score) before I can lock. So, we're working with a music supervisor as well as a singer/songwriter to find and develop songs for the film. I'll need some semblance of that before I can fully lock. Right now thought, my job is to go back through and do another pass, tighten and fine tune so that I can start showing people. I need to have a French screening first (saving time on doing subtitles) and then clean up what I can before possibly showing distributors or sales agents. Plenty to keep me busy. My hope is that we've locked picture by the end of October and I can then send it off to sound and scoring. Oh, and cut a trailer so I can finally show you guys something from it.